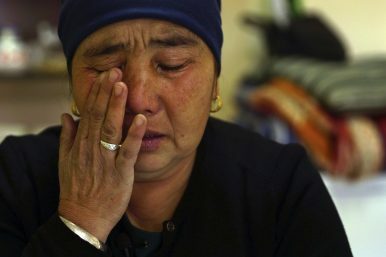 In this Dec. 6, 2018 photo, Nurbakyt Kaliaskar cries as she speaks about her daughter's detainment in a Chinese internment camp during an interview in Almaty, Kazakhstan. Each story is heartbreaking: The ethnic Kyrgyz student from Xinjiang who helped revive a classic Kyrgyz dance went back to Xinjiang in October 2018 and never returned to his studies in Kyrgyzstan; the young Turkish Uyghur woman who had been living in Urumqi with her parents and returned to Turkey to renew her visa only to get news that while she was away, her parents had been detained; two children, aged 7 and 6, with Turkish citizenship traveled to Xinjinag with their mother on her Chinese passport and have not been heard from since; the 75-year old father of a California man, with legal status to stay in the United States, returned to Xinjiang and disappeared. With estimates now suggesting that as many as 1.5 million people — mostly Uyghurs, but also other Muslim minorities in Xinjiang like Kazakhs and Kyrgyz — have been detained in sprawling “re-education” camps, governments around the world have wrestled with how to respond. Those that have responded have struggled to do so effectively. The “sympathy and discontent” Bunin found among university staff in the departments where the students studied and those who knew them contrasted sharply with upper management — both in the universities and the government. In recent weeks, Kazakhstan has taken active steps to tamp down on agitation for greater pressure on China over the issue of ethnic Kazakhs detained in Xinjiang. The arrest of Serikzhan Bilash on March 10 was illustrative of the boundaries of Nur-Sultan’s tolerance in this area. Bilash has reportedly been charged with inciting ethnic hatred. While he has been released to house arrest, the future of the activist group he headed is unclear. There are no shortage of stories to underpin the conclusion that China is engaged in a massive violation of human rights in Xinjiang. But neighboring governments, with deep economic dependence on China and having adopted Chinese narratives about the “three evils” — “terrorism, separatism and religious extremism” — find themselves lacking any avenues that don’t involve bending, ultimately, to Beijing’s will.